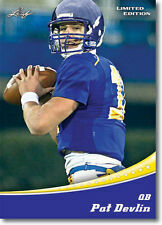 Joe Flacco Delaware Blue Hens. 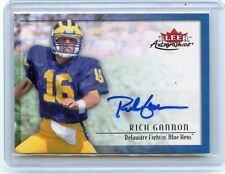 2008 SAGE Silver Level Autograph Rookie Card #A20. Our service is impeccable. Serving the collector young and old for over 33 years! 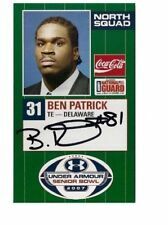 100% Authentic Hand Signed 2007 Senior Bowl Rookie Card of Delaware Blue Hens TE Ben Patrick. 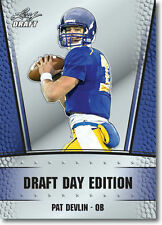 PAT DEVLIN 2011 LEAF "DRAFT DAY EDITION" ROOKIE CARD! DELAWARE BLUE HENS! I will send card in plastic sleeve and top loader. Good luck and enjoy! PAT DEVLIN 2011 LEAF "LIMITED EDITION" ROOKIE CARD! DELAWARE BLUE HENS!